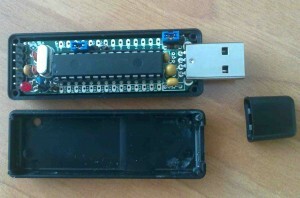 Piccoletta is a PIC developer board in a dongle key format. Power supply can be selected, useing a jumper) between the USB port or an external board. The oscillator can be excluded using a solder pad. On board led can be used as power supply led or as test ping. The configuration has to be done using a solder pad. Jumper to select the boot-loader functionality. Piccoletta can be boxed into a USB dongle palstic box. The ICSP programming connector is present, it is compatible with pic-kit2 and 3/3. A solder pad is present on the connector to exclude PIN-6. Piccoletta can be programmed trough the USB. See you soon for the next article (Description) about Piccoletta. Previous Previous post: CORBA language mapping for the Ruby programming language.